Yo ho ho! 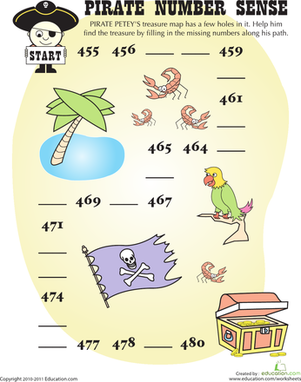 Walk the plank with this collection of pirate printables for young learners. From treasure maps and buried booty to famous buccaneers, your kid will love immersing herself in the adventurous world of pirates. Ahoy! If your child fancies herself a pirate, this Treasure Island crossword puzzle is for her. Ahoy! Pirate Billy needs help counting his treasures. 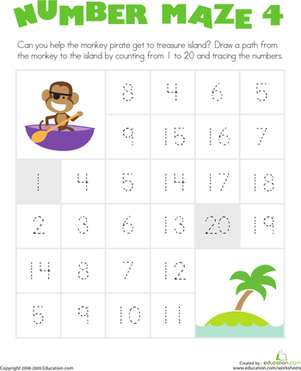 Help your kid practice adding single-digit numbers and writing the sums on this treasure-themed worksheet. Everyone knows that pirates and dinosaurs go together like peanut butter and jelly. Enjoy this seaworthy word search full of mischief and mayhem. What is playtime without pirates? Your child will love coloring and making his own pirate props. Set sail! Your swashbuckling buccaneer will have fun coloring in this prehistoric pirate picture. Meet the mighty Pirate-saurus Rex! He's ready for an adventure, but he needs to dress the part of a pirate. Can you help him? Cut and Paste Playsets: Pirates! Yarrrr! Little landlubbers can set the scene for high-seas adventure in this pirate playset.